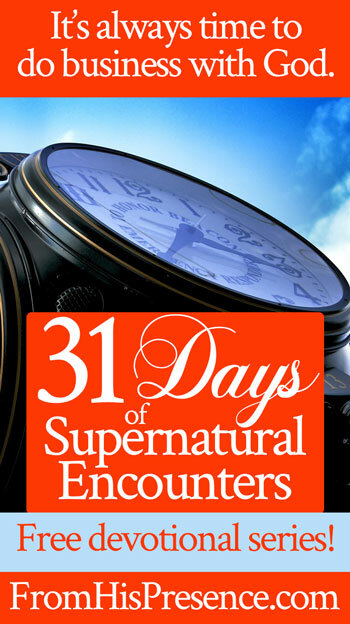 For Day 14 of our 31 days of supernatural encounters, I want to challenge you to decide what the heart motivation of your life is going to be. Pride. It’s an ugly word, isn’t it? And it’s an even uglier heart attitude. And yet we all struggle with it. I know I do. That’s actually one of several reasons I think the Lord told me to blog under a brand name, From His Presence (R), and to name our ministry From His Presence Inc., instead of naming it all after me (as is often done with ministry names). The enemy sends enough temptation to be proud already–I certainly don’t need to see my name in lights. If you accomplish something, the enemy will try to get you to be proud of it. If you haven’t, the enemy will try to get you to be proud, so you won’t take advice and can’t receive from others. And along with the temptation to be proud comes the temptation to steal God’s glory. When we take credit for things, we steal God’s glory. When we bask in our own accomplishments, we steal God’s glory. Or we try to. And God doesn’t like that. God is extremely jealous of His glory. Oh, He wants you to wear it; yes. He wants to clothe you with it. He wants you to carry His glory. But that doesn’t mean any of it is actually ours. It’s HIS glory, and He will not share it. So how do you keep yourself humble, and keep yourself from trying to steal God’s glory? First, I pray often that the Lord would make me humble. We can never pray for humility too much. Pride is a heart issue, and it’s a sin. Every time we notice pride in ourselves, we need continually repent from pride and embrace humility. We also need God to continually change our heart to make us humble. But secondly, we need to decide what our heart motivation will be for the rest of our lives. I was praying about my own heart motivation this morning. I’ve been setting goals for this ministry for the next several years, and writing the vision that I feel the Lord has given me. And every time I set big, God-honoring goals, I have to fight off pride–and fight off the temptation to take any credit for any of it. And this morning, as I was praying over our vision board for the ministry, I felt led to write that on the board–right at the top. We’re asking the Lord to do great and mighty things. They are things that will glorify Him and serve Him. But I HAVE to remember, always, that all the credit and all the glory is His. So I wrote that on our vision board, right at the top. That phrase has gripped my spirit for many years. It really is ALL about Jesus, you know. And it’s Father’s desire that Jesus would receive a pure and spotless Bride, as well as every spoil of the enemy, as the reward of His suffering (see Isaiah 53). So I wrote that on our vision board too. So I wrote that one down too. And I decided to keep these three things written down in front of me to remind me what my heart motivation for life is. That He would get all the glory, and I none; that Jesus would be lifted high; and that the Lamb who was slain would receive the reward of His suffering. THAT is why I work. That is why I pursue His call. Not for my own glory. Not to “build a ministry.” Not to earn a living. Not for any reason other than three simple things … and I need to remember those things. What is your heart motivation for life? Maybe you haven’t ever thought about this before. That’s okay; but today is the day to do so. What deep, inner desire drives you–or will drive you–through life? You don’t have to let your flesh decide this. You can decide it with your spirit, by influence of the precious Holy Spirit. I challenge you to do this. I urge you to do this. 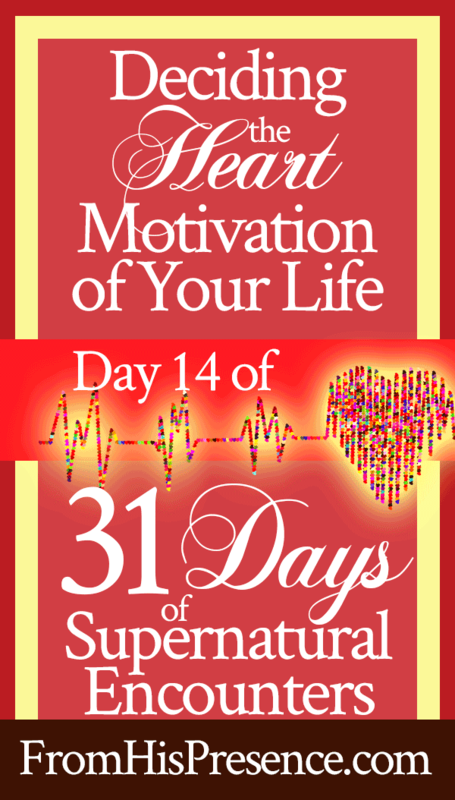 What is your heart motivation? Decide; then write it down. After you do, you can use the motivation you choose as a compass for everything you do the rest of your life. It will make all the difference in the world. “Heavenly Father, in Jesus’ name, I surrender my heart to You yet again this morning. Jesus, please be the Lord of my life in every area today. I surrender my will to You and humble myself before You. Lord, please make me humble. Give me a new heart that seeks after You and Your glory in all things. Please glorify Your own name in my life. I do pray that You would get all the glory, and I none. Listen to my friends (some of which are on our ministry team–you’ll recognize Minister Mamie Blowe) sing about the Lamb who was slain receiving the reward of His suffering. As you listen, focus on Jesus and meditate on your heart motivation for your own life. And you can listen to this whole album for free here. Does this message speak to your heart today? If so, please leave a comment below. I’d love to hear from you! When I typed in https://wordpress.com/stats/adaughtersgiftoflove.wordpress.com the first time after trying other things that didn’t work, I thought okay, my mother’s influence sparked the writing, one day I realized, it was God, the Father, and i was really His daughter. You reach me Jamie, you touch the very core of my being. The Father allows you to read my scroll. I give Him all the glory. In His Presence has filled me, Oh So much! As I read and hear and pray and receive. I realize so many new things the Lord is showing me. Thanks Jamie:) I also am so reminded of the Lamb that was slain, and yes, may HE receive the reward of his suffering, not me. I pray more of him and less of me. Next step is where he is leading me. Heaven open up and bring revelation to this weary, longing heart. All glory , honor and praise to you my King. Sweet sister, thank you as always for allowing our Father to work through you. The Heart Motivations is something I work on daily, I was truly moved by the words of the song “Here’s your inheritance, here’s my life” I give all I am and all I have to God and Christ Jesus who suffered for me. Thank you again sister for this message. I pray we all will come to the realization that our purpose on this has nothing to do with us! We are here for the purpose of the Lord who took our place on the cross. I cannot think of anyone who would of or could done what Yeshua did and has done. We owe all that we have and what he has called us to do, to Him! This touched my because I have been n so much spiritual warefare lately. Yes, I do know why. I so close to coming out of the wilderness that I have been in Satan is trying to keep me there. I refuse to stay to go back. I claim my victory so that I can do what the Lord has called me to do for him and not for me! Thank you Jamie for sharing your heart motivation with us. May the Lord continue to watch over you and your family. To cover your minds with his armor and his blood! Thank You! Lord for Jamie & her Hungry heart for you! The Lord say’s Jamie, you are a Treasure & Pearl in the Father’s Heart! 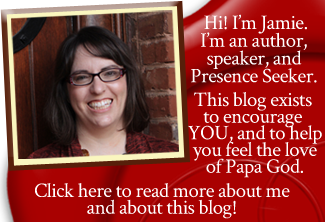 my motivation is this: HE MUST INCREASE….. while i must decrease… keep going, Sister Jamie!!! Father is so proud of you!!!! you are reaching so many people you will never know till we get HOME. GOD BLESS YA REAL GOOD!!! !